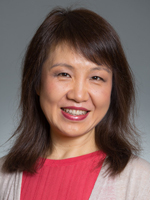 Xiaomu Zhou is an assistant teaching professor and lead faculty member in the Master of Professional Studies in Informatics program, College of Professional Studies, Northeastern University. She received her Bachelor of Science in Computer Science and Information Technology in Shandong University, China; a Master degree in Computer Science and Engineering in Beijing Institute of Technology, China; and a Ph.D in Information Science in University of Michigan (Ann Arbor). Prior to joining Northeastern University, Dr. Zhou was an assistant professor at the Rutgers University School of Communication and Information. At Rutgers, Dr. Zhou's teaching and research focused largely on human computer interaction (HCI), health informatics, and computer-supported cooperative work (CSCW). Her teaching included a variety of courses, such as “Human Information Behaviors,” “Human-Computer Interactions,” “Social Informatics,” and “Health Informatics.” She served on the Curriculum Committee and co-led the development of the Informatics and Design concentration in the Master of Information program and developed foundational courses for the new concentration. At Northeastern, Dr. Zhou is the lead faculty member of master Informatics program in the College of Professional Studies. She led the development of a new curriculum, including restructuring and adding new concentrations and courses align to industry demands. She teaches Informatics Capstone, Foundations of Informatics, Fundamentals of Human Behaviors in Interactive Systems, and Healthcare Information System. In addition to her academic teaching, Dr. Zhou also mentors part-time faculty members and engages in partnerships with business IT leadership. Dr. Zhou has been an active member of her research community. She has served numerous times as a member of the program committee of the Association for Computing Machinery International Conferences on HCI and CSCW. She also publishes and presents extensively on her field, and is a frequent reviewer for several academic journals.